I’m currently reading this book by John Caples, a previous VP of legendary agency Batten, Barton,Durstine & Osborn, Inc., also known as BBDO. 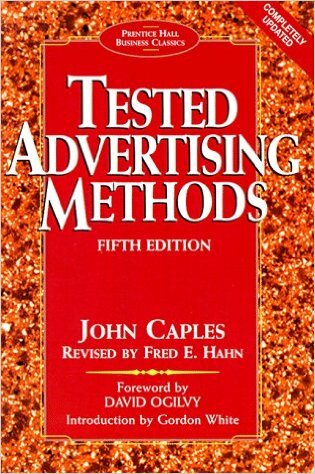 His book “Tested Advertising Methods“ came out in 1974 and it shows that even in the 1970s, people like Caples knew what worked, what didn’t and why. If you want to understand why some ad’s work, while others that seem just as well designed and written fail, check out this book. It’s my 3rd or 4th time reading it and it’s interesting and fun to read every time! Many of these marketing techniques we use today. Things like analytics, measured marketing, consumer survey analysis and other data collection and analysis methodologies, have their roots in Caples ideas and back then BBDO and Caples were doing it without the aid of a computer or the Internet!